Sculptural Jewelry - This is an original modernist beautifully handcrafted sterling silver ring featuring a freeform orange Baltic Amber cabochon, fossilized tree sap. Shanks are adjustable for easy sizing, but can come soldered if preferred. 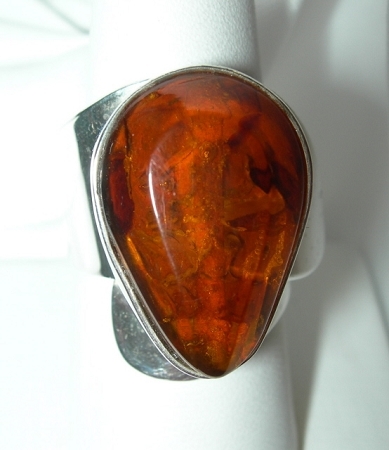 Handcrafted Sterling Silver Ring with a Baltic Amber. This fun ring fits very well on your finger and size is never a problem since it is custom made for you - a perfect compliment to our Baltic Amber necklaces.This ring is a work of art and is signed by Aaron.